As promised and explained earlier, we’ll be doing a year long of weekly giveaways and last September was the start of our 52-week celebration. For this twenty-seventh unit of the biggest audio giveaway the world has ever seen, we’re giving away one Advanced Acousticworkes AXH Universal IEM worth $445USD!! This Universal IEM can become yours and all you have to do is … sign up and leave a comment. Any comment is good but let’s keep it entertaining and comment Portable player or phone you are using as a media player. But first, let’s look at AAW and the AXH Universal IEM. From the AAW website: AAW leads the premier In-ear Monitor market with its distinctive innovations on driver technology. 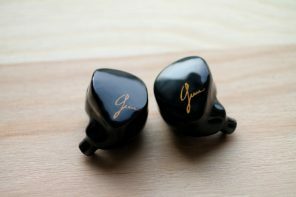 We design some of the best balanced armature with dynamic driver hybrid system in custom and universal in-ear monitors. 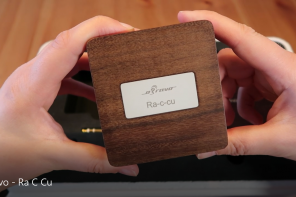 However, our miniature planar magnetic and electro-static driver system are truly state of the art technology in the portable audio world, unmatched by competition. Each of your AAW In-ear Monitor is handcrafted by our technicians with the most meticulous quality standard. We are the Mechanics of Sound. 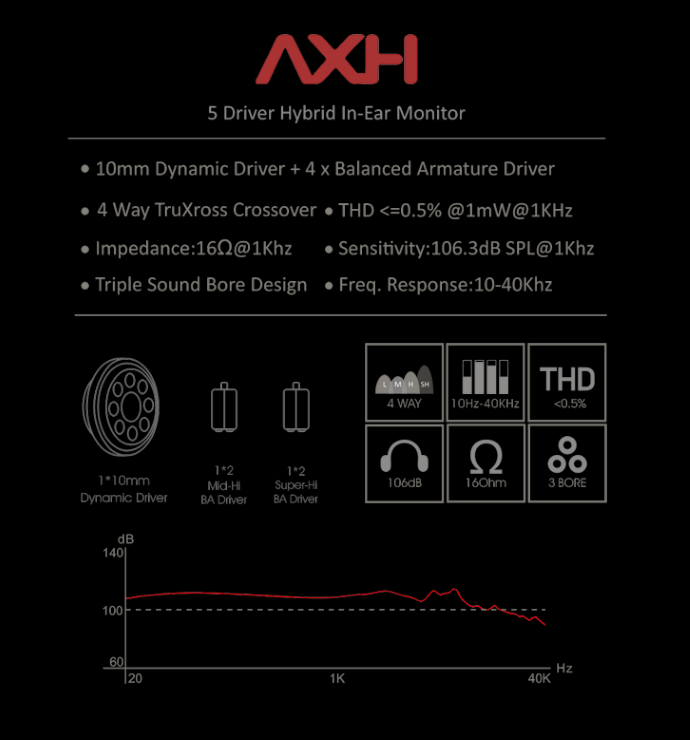 AAW is known for our exquisite hybrid drive technology, AXH is their latest effort in such ideology of combining the best traits out of dynamic and balanced armature drivers. Instead of creating high order RC crossover network, which usually causes chaotic phase shift and scrambled arrival timing, AAW uses a complete new approach called TrueXrossTM to solve the classic coherence issue in hybrid earphones. The dynamic driver is individually tuned diaphragm wise and by further utilizing a physical low pass filter, it is to only function in minimal overlapping frequency range as opposed to the balanced armature driver. Coupled with delicate positional arrangement and the new stainless steel acoustic bore design, AAW is able to achieve improved coherence, minimized phase shift and optimized arrival timing of music signal. The lucky winner will get his IEM shipped directly by AAW. AAW will cover the shipping fee but neither AAW or Headfonia will cover any other expenses such as VAT, import fees, tax, etc. This is all the winner’s responsibility so if you’re not up for that, it’s best not to enter. AAW also won’t lower the unit’s value for shipping. And while you’re at it like the AAW and Headfonia Facebook pages HERE and HERE, if you haven’t already. The winner of the AAW AXH unit will be announced next Monday as usual. That means you have till Sunday evening to enter this AAW giveaway! Thank you AAW for doing this with us! Good luck to everyone! I’m currently using an iPhone 6s/Xs Max as a source and FiiO Q5 as an amp. Thank you very much for all the great articles and most of all the helpful information, now added with the giftaway! As for mobileI use my Note 5 . At home ,I use SONY X707ES and CAVALLI AUDIO-LIQUID CARBON. I appreciate all your publishing articles and efforts and times! Listening to some drum n’ bass through my friend’s old HD650s he gave me as a gift. I’m in college and I’ve been having a difficult time financially lately but I’ve been trying to save up for some good IEMs. Really hard to find what exactly you’re looking for. 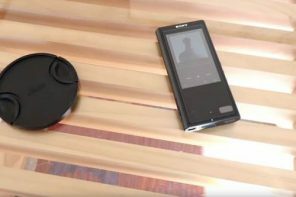 I use either my phone when out and about or an iPod Nano connected to a portable speaker at home. Still have my old HiFi system with a large stock of records and use that if I want good sound quality or to record music to play (sometimes borrow records off friends) and iTunes to download. 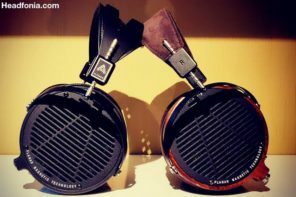 Headfonia has always been my favorite place to see reviews! I’m currently using a Nexus 6 to listen as my source, and my headphones are default Samsung earbuds. Source I would use with these IEM’s would be an Galaxy S9 with an OPPO HA-2. I love your reviews. Very concise. These look awesome, just entered! Hi folks, good luck tot you all! If i win i will hook these up to my fiio x3ii though i would better consider upgrading to an m9 or so. 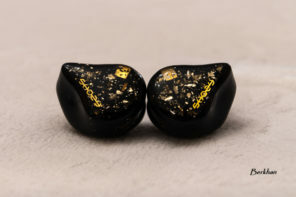 Have heard some of the new range of iems from AAW including the Canary (electrostatic hybrid). Very good sounding and pretty design. Currently using Hiby R3+Mojo for portable music listening. I’m using a LG V30+ with it’s quad DAC to listen to music. AAW…this so cute. I’ll use it with modified Xduoo X3. I’ll pair it with my VE Odyssey for now until I get an iBasso DAP. I’ll be using it with an LG V30+. I’ll be using them with a Fiio X5 III. Using a Moto G4 Plus. Soon to pull the trigger on a Hiby R6 Pro. I’d be using the AXH monitors with my Fiio X1 (early edition) feeding my Cayin C5 listening to Herbie Hancock and company. I will use it with Hidizs Ap80. Good luck and congrats to whoever gets it! I’m currently using Hiby R6 Stainless Steel, and Shanling M0 for on-the-go. Am I the only one who can’t spell this giveaway item right on the first try? iPhone/iPad with a AQ dragonfly red. 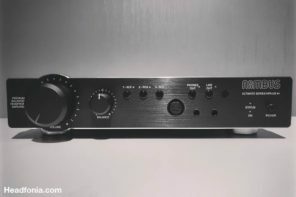 MicroMega M-100 to IEMs… Tidal and Qobuz for source material. Phone (irrelevant), Spotify Premium (highest quality), AudioQuest Dragonfly Red, InEars Euphoria or UltimateEars UE7 depending on the mood I’m in. I’m using a pair of airline earbuds to listen to my mp3’s. Hopefully I can win these so I can start my audiophile journey! I’ll use it with Hidizs Ap80. I run my Galaxy S8 through an XDuoo XD-05 DAC/Amp. I also use it to power my HiFiMan headphones for a bigger sound. I have 500 gb of music in a Fiio X5 and a whole bunch of headphones for every on the go scenario, except all out war. In that case, I’ll just stay in. Hello, I am using Opus #1 which is a great dap. I’m using the iphone xs max as my source. I’m using an iBasso DX90 for portable and a Schiit Modi2u/Asgard2 for desktop. This would be a lovely addition to my earphone collection! Ipod modded with 500gb flash memory and 100 hour battery life per charge and fit with a xduoo portable amp that throws out great power for iems and most power hungry cans. Will be pairing it with my Cayin i5. I have a 4TB hard disc of music, running through my computer with Audio engine speakers, and others, a streamer, an Audioengine B1 etc. Works pretty well. Pretty much anything I wanna hear, in whatever room. Currently using an Onkyo DP-X1 as my source. These look gorgeous. Good luck everyone! Just found this site because I was looking for new headphones. 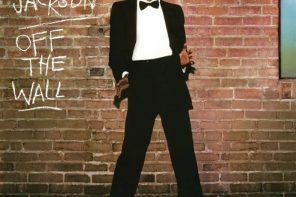 Always been a big fan of music and have been looking for something that would let me dive deeper into the pieces. Fingers crossed, good luck everyone! All I have is a GS9 and soon to be a GS10. I need to step my game up quite a bit 😂, I’m sorry. I need it for listening my awesome music!!!! 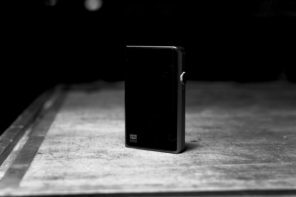 Fiio M9, stand alone for work, transport for Chord mojo at home. I usually play music through my computer and my phone. Back to try my luck? Im definitely try my luck again to win the AAW AXH! Congrats to all. May we all be winners in our lives and be grateful to have guys like these to make our lives a bit better daily..
Im using an S8 as a source and Fiio M7 as an amp. My current audio source is a FiiO X1 (gen 1), but I’ll soon be replacing it with a FiiO X3 (gen 3). Kinda curious to see (hear?) whether it will be a decent upgrade or if I’ll even really notice any significant difference. Galaxy S7 with Lineage OS. I stepped on a Corn Flake, now I’m a Cereal Killer. I typically use my Marantz 6200 turntable for spinning records through a Marantz 2265 integrated that powers a pair of inline JBL L100 Centuries. 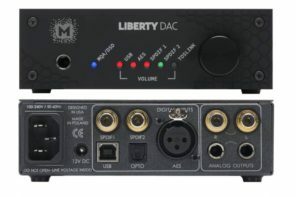 If I’m listening digitally then I either hook up my galaxy s7 and plug it to the input section of a Schiit Asgard 2, which outputs into the Tape In section of the Marantz and out of the JBLs after proper gain staging. Or I listen via Spotify through either my Universal Audio Apollo Twin Duo or Apollo 8 quad that’s hooked via thunderbolt into my mid 2012 Macbook Pro. Always plenty of options to utilize. Hi, I’m listening to my music on iPhone 6s because I have all my music, since 2003 in iTunes . Will be using iPhone 8. Using my ak70mkii as the source. Sometimes I’ll use my laptop when working. Sweet. My iBasso DX80 recently died so I’ll have to use them with my Magni 3/Modi 3 on the desktop until I decide on a new DAP. Running my macbook through a Zoom Tac-2 recording interface. 24/192 and love the interface. 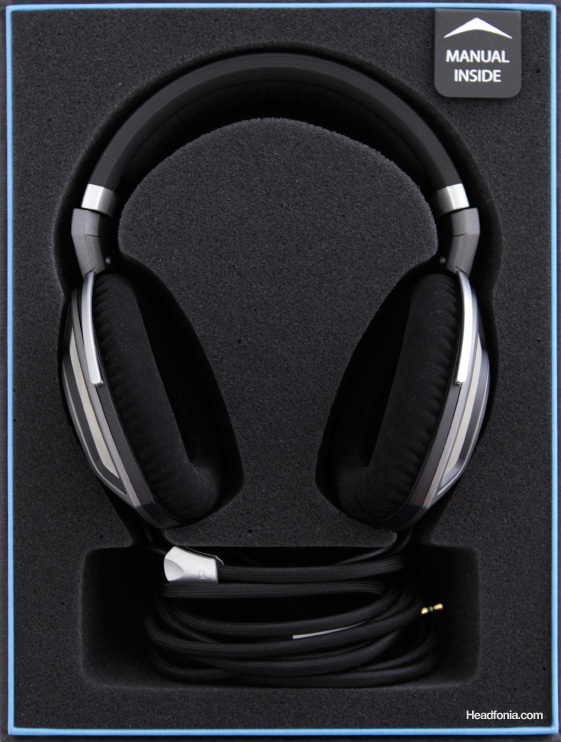 These look pretty nice and would be a nice upgrade to my current JVC HA-FD01s. Yet another awesome giveaway! 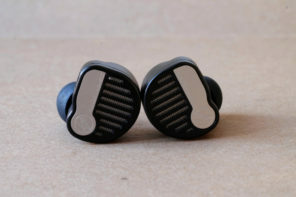 I’d love to try this, my only IEM’s so far have been ATH-IM04’s. Possible setups: Cowon Plenue D > FiiO E17, or my Dell XPS15 > Jitterbug >FiiO E17/FiiO E09K. Just starting out my journey in high end audio, these would be a step up from my TWO or 1more quads. I use a one plus 6 on the go and an FX Audio DAC-X6 at home. These one are made for me … good luck all. For now I only use my main mobile phone for listening on the go, using Spotify premium and sometimes JOOX, and good luck everyone. I was previously using a Micro iDSD Black Label for portable audio, but ever since I bought the LG G7, I’ve left the iDSD at my desktop. Love to add this to my small collection. My Fiio K3 is waiting. Never tried this brand’s any iem. Hope it’s time to get a chance to do it now! AAW makes the most beautiful IEM designs. All the best everyone! Probably i need proper dap for this one. My source is an iMac and then through a Hugo 2. With just an philips mp4 player. Currently using a Sony Xperia Phone as my media player. I use the simplest source and just listen from my phone or laptop currently. AXH is tuned with a balanced sound signature in mind. Onkyo stereo with an old iPhone full of music plugged into it, a Bose Bluetooth speaker with another old iPhone. Streaming and a big old stereo with big old Mitsubishi Diatone speakers, a record deck, MDs, CDs, etc etc all sorts of madness going on here. Cayin N6. Truly beautiful sound eclipses the horrific interface. Good luck everyone! Especially me! Ho Ho. Wow, Another Great Prize ! AAW looks so cool ! Call me old fashioned but would love to pair these up with my ALO Class rig. 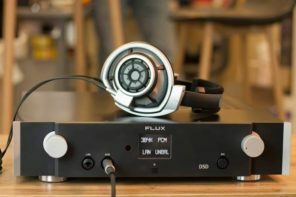 My laptop connected to an external DAC/amp: a Fiio K3 for IEM and a Burson Conductor (Burr Brown version) for big cans. Good luck (expecuially to me)! Im using an S9+ with a fiio BTR3, might have to upgrade to an amp that is worthy of these iems. Will use it with a Chord Mojo. Currently using: RHA L1, Xperia XZ1, or Fostex A8 as sources. Coincidentally just found this model yesterday and decided I might have to pick it up eventually. Currently using hiby r3 as my portable dap. I have two ears so that would fit me perfectly !! Lets get this party started, haha. looks like a very nice iem. I hope I win. I use my iPhone Xr for music when I am on the go! I mainly use my LG V30 with B&O dac. Would love to win this for music and work! Will be used with Moto G6 phone. Good luck! S7 Edge + ES100! Perfect for this one! My sources are Q1mk2 and an old Galaxy Note 3. Would love to hear this actually well-tuned hybrid! Source is Hiby R3 for now. looking for a R6 soon! What a wonderful contest! I occasionally use an LG G6 with Final earphones but clearly an upgrade is required. Aaw one of the Best iem that i ever heard.. Just try !! I’ll be using either my M5s or QP2R. Who should I sell my soul to get them? Awww, that’s would be an great upgrade. A first step into that price range. I constantly switch between my Galaxy S8 and my iPhone 7 Plus for music. I’m using lg v30 with ve zen on the go, and xduoo xd-05 with pinnacle p1 at home. It would be fantastic to try something better and take music to the next level. Hi, im using a dragonfly red. PC: FX Audio Dac X6/Hifiman HE 400i. I need this for my xdp 30r! At home I use a Windows 10 PC with Audeze Deckard DAC / AMP and usually listen to Beyerdynamic T90’s or Sennheiser HD6XX. When mobile it’s my Nokia 6.1 feeding Sennheiser Momentum in ears, or Hidizs Sonata with UE6000, or FiiO E18 and Grado SR80 depending on where I am. Youtube music from my desktop atm. Most music gets listened to on my work laptop’s headphone jack to xrk971 pocket class-A amp that I built. It’s also what I use for serious on-the-go listening sourced from a Galaxy S8. Cowon Plenue 1 and Plenue S, depending on my mood. My audio sources is an old ipod I bought on the cheap, my mobile and my laptop. The most prefferable out of those 3 is my laptop. Make my ears great again, ha, ha. Would be nice if I could get my hands on this one! I still just use my phone and a Fiio E18 for IEMs. 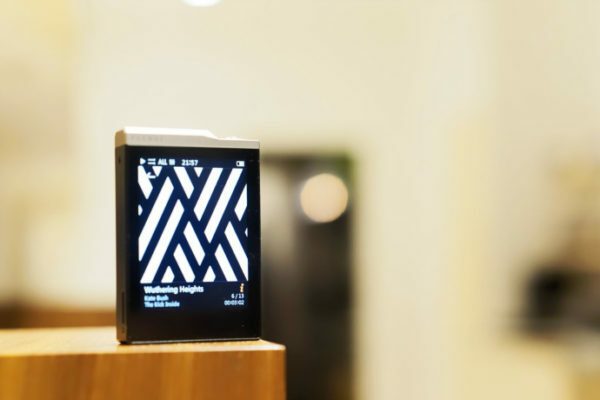 To compliment the AAW AXH i will use my Astell & Kern AK70 MKII along with my Oppo HA-2. 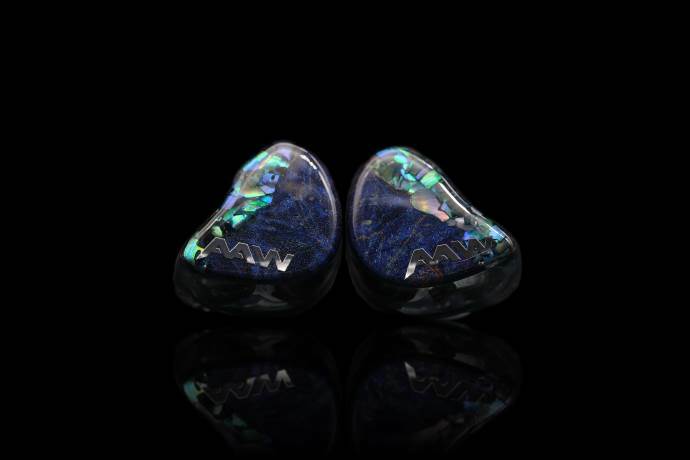 If I win this will be the first really high end IEM’s I have tried. Thanks!! Still rocking a now very beaten-up and nearing replacement/upgrade time Sony A17 on the go, but keep a Dragonfly plugged into my PC as my main sound source when at home. Mainly listen to music on my PC. Got everything here, easily accessible. Thanks for the giveaway! And good luck to everyone! There are two holes in my life that these would fill. These seem awesome. Goodluck everyone! Use a Essential phone usually as source with Tidal master, and have multiple amps I may go through. Oh, I can’t wait to try these things out. Love to try the earbuds and compare with others I have! A beautiful looking set of IEMs! Good luck for everyone ! ! ! Always wanted to find out more on how music will sound with a better earpiece. Christmas for at least one lucky winner every weekend. Keep the good reviews and updates coming! I will pair them with cayin i5 for now. I heard AAW AXH and it was great! Using Hidizs AP80 and Fiio X3 (1st gen!) 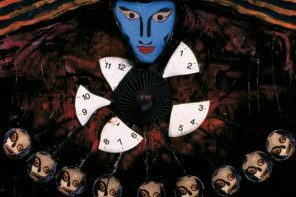 to play my music. Still works and sounds great to me! These look sweet. I currently use Fiio X7 and LG V20. I’m sure it will be a good match with my WM1A. 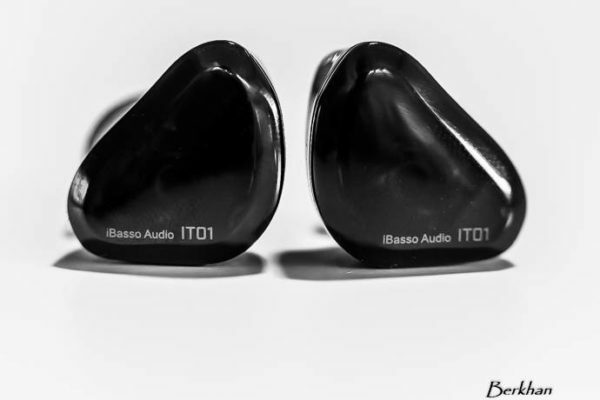 WOW, I’m wondering how these sound with the Ibasso DX120. Have yet to find an IEM that gets me going. So I’ll sit this one out to increase the odds for everyone else. Then again, these look pretty sweet and so does the design! Now that I’m halfway there, I may as well enter after-all! Wow, my ears are all set to win. Good luck , I’d use it with my trusty cow on j3! At home it’s an ADI-2 PRO, portable is either ES100 or DX80. The AXH looks great! You can never have too many headphones. Just in case. Excited to use it on my iPhone 6! Now I always use Spotify on my phone, for convenience. Some times I’ll use Spotify on the computer, but it’s becoming very rare. Should be listened with my new dac…. These in-ear monitors look incredible. Thanks for the giveaway. Wowwwww i really want it…. Right now, my main way of listening to music is my MPOW-59s. They are pretty good headphones but I don’t have any earbuds and it’s so hard to find ones that fit my small ears (they are smaller than 2 inches, I measured). So I’m hoping something like these would fit perfect! 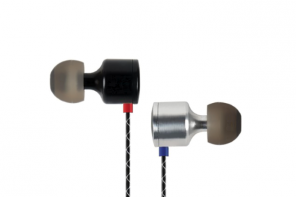 I´ve been looking at IEM´s for a while now, and these seem like a kill. I really hope I win this one. I’m currently using cayin N5 and shozy alien gold to hear my music x). The Source is my Flac files stored on a large hardware Raid/MacPro tower. Would be forced to aquire proper DAP to pair. Now using Zuperdac. 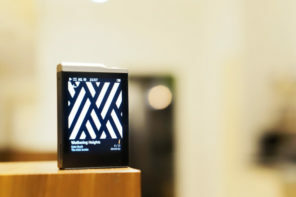 I would be using this with either my Shanling m3s or my Hidizs DH1000. Mostly playing via iPhoneXS+ProMax (or whatever this model is called) and Mojo. Good luck to everyone. I will hear it through my Zishan DSD. 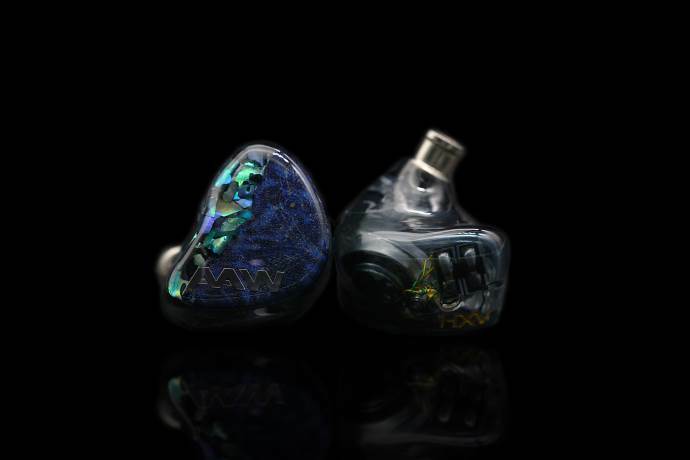 You guys better give me this IEM! Fill my empty head with music! Here we go again. Fingers crossed everyone! These are going to pair well with my ZTE Axon….they are even the same color! Anyone else got a ZTE Axon 7? I would (or will be 😉 feeding this IEMS with my Hugo2! Sorry folks, nothing to see here! Move along, because this time it’s gonna be mine. Seriously though, good luck to all! it’s gonna be sweet for my WM1A, good luck everyone! Hey I am living in Singapore! I’ll pay using a chord mojo. Just because your chances are slim doesn’t mean you should give up. I’ll be using it with a Samsung phone. These look really nice, would love to win them. Time to try out these babies! Using Sony NW-ZX2. Probably a B E A S T of a pair with this! I use a samsung mobile phone for music. but i would really like to have a top quality earphone. i also play banjo, guitar, and acoustic guitar. These look amazing. I’d love to use them all the ime. Would pair it with my wm1a. This sounds like it would be perfect! Another giveaway of a gorgeous IEM. And still with my S8 here, hope to upgrade soon *finger crossed*. Hiby r6 pro it is! Mac Book – Tidal – DragonFly Black. I am using iPhone X and Chord Mojo combo for portable music listening. My source: Pandora for background or a plethora of mp3, flac, wave, etc. files via winamp on PC. Great gear for yer ears. Using a Fiio M6 with the Fiio Q1 Mark II held together by Blu-Tack. Great Gear. Great Reviews. Great Giveaways. What isn’t there to like? Cheers! This sounds good to my ears…. Will love to win this. Using the good old latest generation of the classic iPod classic 160GB with Rockbox installed. I Will use it with ny chord mojo. Great IEMs!!! I will use tren with my Fiio!! For AAW, AXH is really a secret weapon. And it’s the one which make me becoming a fan of AAW. And I really looking forward to the annoucement of thier new lineup in Taiwan, especially ASH and Nightingale. Need a new IEM anyway. 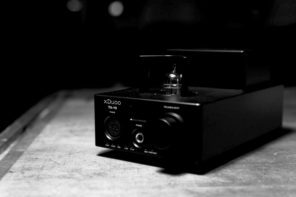 My brand spanking new source is an iBasso DX150… I’m chuffed! Time to retire my Sennheiser Momentum2 In-ears! a new iem would be great! Several chi-fi DACs, Sony Walkman & Xperia phone. I would love to try something this awesome with my iPhone 7! Thanks headfonia. Dx200 and wm1z baby! Will match nicely with my LG V30+, listening to Tidal Masters thru MQA. As a Singaporean, we so proud of a local company making a mark on the international item market. More good stuff from AAW please. Phone apart, after a long term love affair with a cowon j3, I currently mostly use a hiby R3 and it’s great. Using (and loving) my Opus#1. Man, they hit it out of the park with this little DAP. Just realized I read what to comment wrong 😅 whoopsie. My main method of listening to music is through my phone (Pixel 2). Spotify for the win!! Really loved the sound on this! I have so many formats, gadgets, wired and wireless, I’m spoilt for choice. I love this stuff. Jazz deserves the best. Here goes nothing 🙂 Still rocking my good old OPUS #1 for the time being. Good luck everyone! Very curious to hear these combined with my iPhone XS and my IFI iDSD. I use my galaxy s8+, surprisingly good! I’m waiting with open ears! Would love to get this IEM. huge supporter of local products. Amazing Aardvarks Windsurfing! What I’d do to have an Automated Xenon-based-life-form Housekeeper! To charge my Questyle QP1R or Galaxy S7 when I’ve got too many things on my mind. These look really nice and would love to hear how they pair up. Would love to pair these with my newly bought xDSD… I’m using Tin audio T2 right now so these would be the perfect upgrade!! Currently using iFi nano dsd. Would love something new! Listening on my S9 plus most of the time commute and work. Fiio X5II at home. Looking for a nice pair of iems to pair with my new Mojo. mostly listening to music thru my Dish Network subscription or via “Alexa” in early am. Would love to win these. These look so special. 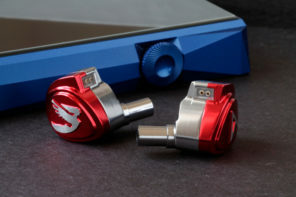 I’d love to own a pair of high-performing IEMs like these. I’ll use them with my Astell & Kern A&Norma SR15. Planning to use with a Hiby R3. Thank you for the opportunity to win these beauties. Count me in an someone appreciate of good things in life! It’s better than a poke in the eye. Very nice, very early Christmas present. 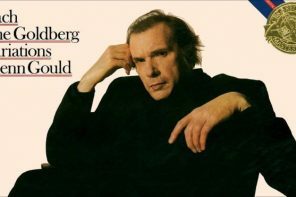 I listen on my computer, my ipod and phone. Trying my luck. AresII Effect Audio Cable + iFi nano iDSD Black Label to pair. My sources are for desktop an denafrip ares DAC to a Massdrop LCX or Audio gd NFB28, and portable Fiio x5iii to a meier 2stepdance portable amp. Best of luck to everyone. Now i just use entry level hybrid iem. But i like it. I wonder how it feel with an expensive iem. It will be used with my good old trusted IBasso DX90. Since I didn’t win any other source here yet. Says page can’t be found when I click on the link. Would absolutely love to win this. I think it would round out my collection quite nicely. Would love to give these a tries. Thanks for running this giveaway. It’s still the 24th but your form is down. I’m not sure what your time is..EST PST or something else?